The Heavy-footed Moa (Pachyornis elephantopus) was the largest member of the genus Pachyornis and the third largest species of moa overall. 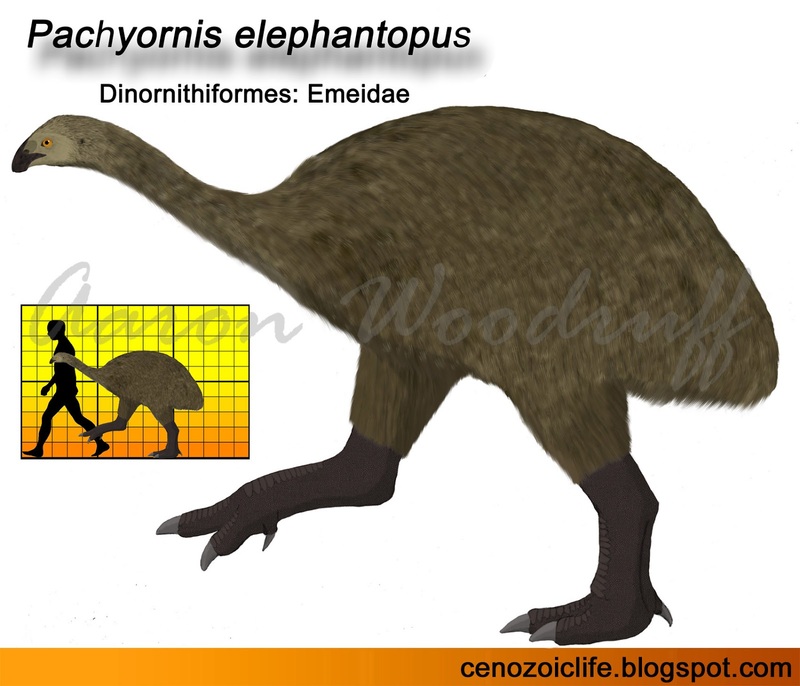 This exceptionally heavily-built species lived in South Island during the Pleistocene and Holocene where it fed on relatively low-quality plant matter. Natural History, University of Michigan. Wiki. 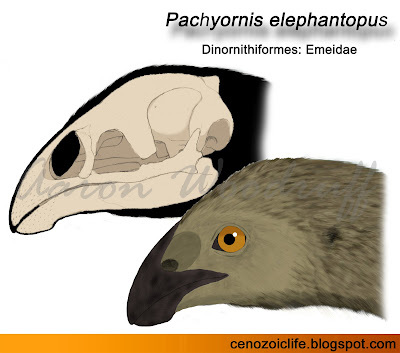 The genus name Pachyornis is derived from the Greek words pachys (meaning “thick”) and ornis (meaning “bird”), a reference to members of this genus being particularly heavily-built compared to other moa genera. The species name elephantopus is a combination of the Greek words elephas (meaning “elephant”) and pous (meaning “foot”). Its full scientific name therefore translates as “Elephant-legged Bird” in reference to this species’ robust skeleton with particularly thick limb elements, a trait which is further emphasized by common name “Heavy-footed Moa”. Heavy-footed Moa had an extensive late Quaternary fossil record. Their preferred habitat appears to have been lowland to montane grassland, shrubland, herbfields, and forest margin environments in the eastern and southern parts of South Island. The altitudinal limit for this species appears to have been 700m above sea level as no fossils for it have been found above this point. Heavy-footed Moa underwent significant changes in relative abundance and distribution in response to environmental changes during the late Pleistocene and Holocene. Climatic and environmental fluctuations during glacial cycles caused its preferred habitat to expand and contract repeatedly, resulting in two genetically distinct populations in the northern and southern halves of South Island. Like all other moa, it held a relatively constant population size until the arrival of the Maori in the late 13th century. The Heavy-footed Moa is the third largest species of moa behind both species of Dinornis and is the heaviest moa relative to its size. It stood up to 120cm tall at the hips and 180cm tall when fully erect and weighed up to 145kg, with females being larger than the males. The skeleton was robust with relatively thick leg bones and shortened tarsometatarsi (in birds, the foot bone formed by the fusion of the metatersals). This species is known from desiccated soft tissue remains recovered from cave sites which have preserved skin, tendons, and feathers. From these subfossil remains, we know that this species had shaggy, white-tipped feathers which would give the living animal a mottled or speckled appearance and that the skin of its lower legs were covered in non-overlapping scales like those of most birds. The beak was long, sturdy, and downturned and its overall head was shaped somewhat differently from other moa and was adapted to handle particularly tough vegetation. Plant remains from within coprolites and among gizzard stones reveal that Heavy-footed Moa were generalized mixed-feeders with a diet consisting of at least 21 species of particularly fibrous grassland, shrubland, and forest margin vegetation. It grazed on various types of herbs and grasses and browsed on the branchlets of trees and shrubs. As with most of the larger moa species, the only predator of adult Heavy-footed Moa was the Haast’s Eagle (Harpagornis moorei) with the smaller Eyle’s Harrier (Circus eylesi) possibly feeding on the smaller juveniles. Evidence from coprolites further shows that this species hosted several types of taxa-specific parasites. Heavy-footed Moa are thought to have been less abundant than other moa due to its less frequent representation in the fossil record. Females appear to outnumber males at natural fossil assemblages, suggesting that males were even less common in a given population. This relatively low number of males may be due to increased predation by Haast’s Eagles who likely targeted them more regularly due to their smaller size. Heavy-footed Moa eggs were among the largest of any moa and the only known moa embryos are also attributed to this species. The growth rate of this species is not known. It became extinct abruptly due to human overexploitation and habitat alteration.